The speaker of Bhagavad Gita in Adhyay 18 Shlok 62 is instructing Arjun to go in to the refuge of some other Supreme God to attain Supreme Peace and Eternal Place. Then he further says that this God that I am pointing you towards is my Supreme God too. 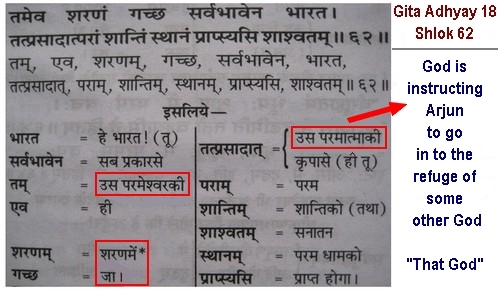 Translation: (Bharat) Oh Bharat! You (sarvbhaaven) in every respect (tam) that Parmeshwar/Supreme God hidden in the darkness of ignorance (ev) only (sharnm) in the refuge (gachchh) go (tatprsaadaat) by grace of that Supreme God /Parmatma, you (paraam) supreme (shaantim) peace and (shaashvatam) the everlasting, Sat (sthaanm) place – dhaam – lok (praapsyasi) will attain. Translation: Oh Bharat! You, in every respect, go in the refuge of only that Supreme God hidden in the darkness of ignorance. By the grace of that Supreme God, you will attain the supreme peace and the everlasting – Sat lok (place-dhaam). In Gita Adhyay 18 Shlok 64, it has been said that now again hear the most confidential knowledge of all confidential knowledge that this very Purna Parmatma (about whom there is a mention in Adhyay 18 Shlok 62) is my definite venerable God i.e. I (Brahm / Kshar Purush) also worship Him. I will say this in your benefit. Translation: (Sarvguhyatmm) the most confidential of all confidential (me) my (parmm) utmost mysterious (hitam) beneficial (vachH) words (te) to you (bhooyH) again (vakshyami) will say (tatH) these (shrnu) listen to (iti) this Purna Brahm (me) my (drdam) definite (ishtH) venerable God (asi) is. Translation: I will again say the most confidential of all confidential, my utmost mysterious beneficial words to you, listen to these — this Purna Brahm is my definite venerable God. God Brahm (Kaal God / Kshar Purush), the giver of the knowledge of Gita, is saying in Gita Adhyay 18 Shlok 65 that if you want to remain in my refuge then worship me with undivided attention. Abandon the worship of other gods (Brahma, Vishnu, Shiv) and Pitras etc. Then you will attain me only i.e. you will go to the Mahaswarg (Great Heaven) built in Brahmlok. I truly promise this to you. You are dear to me. 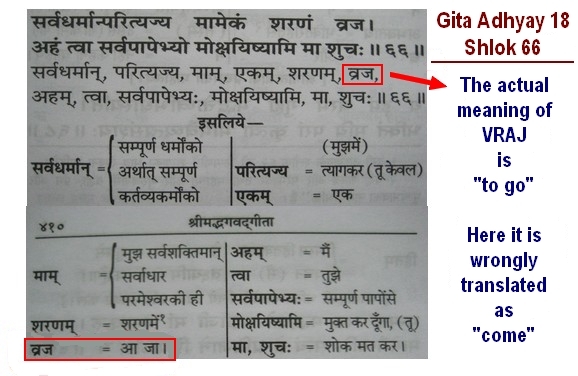 Then again the speaker of Bhagavad Gita says to Arjun in Gita Adhyay 18 Shlok 66 that if you want to go in the refuge of that (Ekam / One) Unique God i.e. who is unequalled, the Almighty, the Creator of all the brahmands and the sustainer of all, then leave the sadhna(worship) of my level, which is the earnings of the jaap of Om naam, and the other religious scripturebased yagya in me (as a result of which you will become free from my debt). Go (vraj) in the refuge of that One (Ekam) Supreme God i.e. One who has no match. I will liberate you from all the sins (the debts of Kaal); you do not worry. Translation: Abandoning all my religious practices in me, you go in the refuge of that one Purna Parmatma (Supreme God). I will liberate you from all the sins; you do not grieve. God Brahm (the speaker of Bhagavad Gita) has given very decisive knowledge at two levels. He says to Arjun that if you worship me with one mind then you will achieve me but if you want to achieve eternal place and supreme happiness then go in to the refuge of that Supreme God.